*Both Physiotherapy and Massage Therapy are eligible for reimbursement through most extended health plans. Please ask for a receipt at the front desk to submit to your insurance provider. The most common insurers in Victoria that cover Physiotherapy and Massage Therapy are Great West Life, Sunlife, Greenshield and Pacific Blue Cross. Gift Certificates make a wonderful present for friends and family. 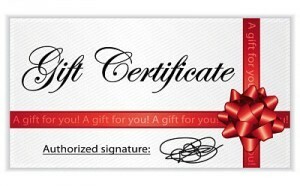 Call us to purchase the gift certificate and we will send it in the mail to the lucky recipient.